Galley Wench Tales: Bottomless Mimosas! Cruisers Aground in JAX … It’s Not All Bad. 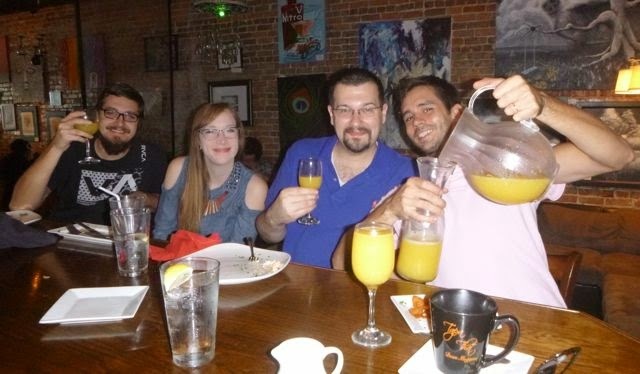 Bottomless Mimosas! Cruisers Aground in JAX … It’s Not All Bad. leaves a carafe to do the job when he’s out of range. Cruiser aground, temporarily, in Jacksonville, Florida. We’re a month away from saying farewell to Five Points, our hurricane hole. Time was running out for being served Sunday brunch. Wayne was looking for a good cup o joe; I was looking for a nice meal to assuage my grumbling stomach. 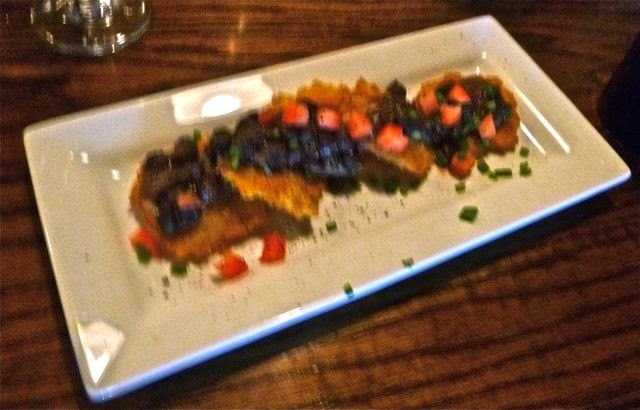 Tapa That was well rated on both in Trip Advisor, Urban Spoon and Yelp. Admittedly, it was the bottomless mimosas that sucked me in. 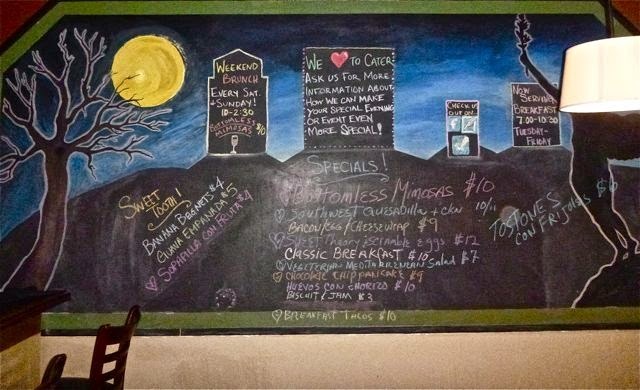 Lots of yummy Sunday brunch options on the TapaThat blackboard. the satisfaction of the truly well fed. 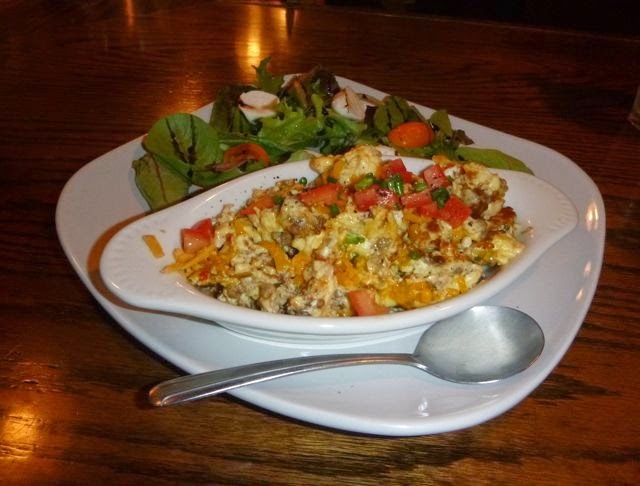 “The huevos con choriso… I’ve had it, maybe … 20 times,” admitted the nattily dressed lady in leopard print, broad gold bangles and a black fedora with Jackie O sunglasses hugging the brim. “And the beignets? They will make you weep,” the self-described “recovering English teacher” dramatically declared. Tapa That testones. Oh yes! Sadly, the beignets were not an option on our gluten-free diet. Michael graciously subbed out the flour tortillas with rice tortillas for the chicken quesadillas; we will definitely look into those for home-made wraps! 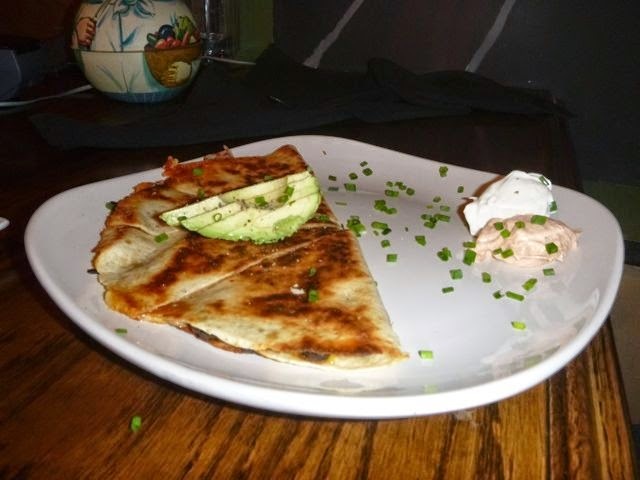 The daub of chipotle mayo added the perfect touch of light bite to quesadillas. Delish! We agree, the testones are fabulous. Thin-sliced lightly crisped plantains are fine and good; it’s the garlic-drenched little black bean topping that does a savory dance upon the tongue. a spectacularly good balsamic drizzle. The huevos con choriso was light and surprisingly ungreasy. Good, though a bit too used to huevos rancheros, I missed the tortillas and beans. We, too left full, but not too full, lazily loping our way back home, warmed by a great meal, enjoyable conversation, mimosas and the fall sunshine. Yes, we miss our boat. We are itching to break free and continue our adventures. Meanwhile, it ain’t a bad place to be stuck a little while longer. with rice tortillas and tangy chipotle mayo. We’re in Jacksonville FL and our boat’s in Green Cove Springs, FL, until Nov 18th. We returned back to our temporary landlocked abode, and worked on our get-ready-for-the South Pacific checklist. (If anyone has a killer deal on an SSB modem or an unlocked sat phone, let us know!) Sometime in December our journey begins anew.